Eco-friendly, natural solid beechwood beds influenced by the Oriental tradition but with an Italian design. The design of this model is a masterpiece of cabinet making. The project is based on the idea of self-assembly of one's own bed by stacking the components around two big dowels. 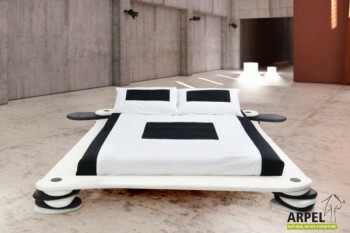 It's mainly designed as double bed. Slats and revolving bedside tables are included. Eco-friendly Diago bed with a diagonal slatted mattress base eliminates the visual discomfort caused by inclined walls, by redirecting the view to a specific point of your room. You can customize the feet/buttons and frame of your bed with different colours in order to get a two-coloured bed. Slats are included in the price. Eco-friendly Diago bed with straight slats mattress base and snap-fit assembly, presents a minimalist design and a thick frame (52mm). You can choose between different colours for the frame and foot/buttons, getting a two-coloured bed. Slats are included in the price. Zen and Tao philosophies have in common the respect for full and empty spaces, features which are proposed in the Ultra bed. An elegant and ecological bed whose parts are combined tastefully to create a particular wooden frame (frame, headboard, feet and side tables). Slats are included in the price.